Dice pancetta. Peel and mince shallots and garlic cloves. Zest lemon and juice half of it. Grate Parmesan cheese and add to a large bowl with the egg yolks. Season with salt and pepper and most of the lemon zest. Toast hazelnuts in a small frying pan over medium heat until fragrant, approx. 4 min. Finely chop and set aside. Bring a large pot of salted water to a boil. Add spaghetti and cook until al dente, approx. 7 – 9 min. Reserve about 100 ml/ 1/2 cup pasta water, then drain. Meanwhile, in a large frying pan, sauté pancetta in olive oil until crisp. Add garlic and shallots and let cook approx. 5 min. over medium heat. Season with salt and pepper, then add drained pasta with a quarter of the reserved pasta water. Toss well to coat. Transfer the pasta to the large bowl with the cheese and eggs. Toss well using tongs and a rubber spatula, adding more pasta water as needed to create a smooth, glossy sauce that coats the pasta. Add lemon juice and toss some more. 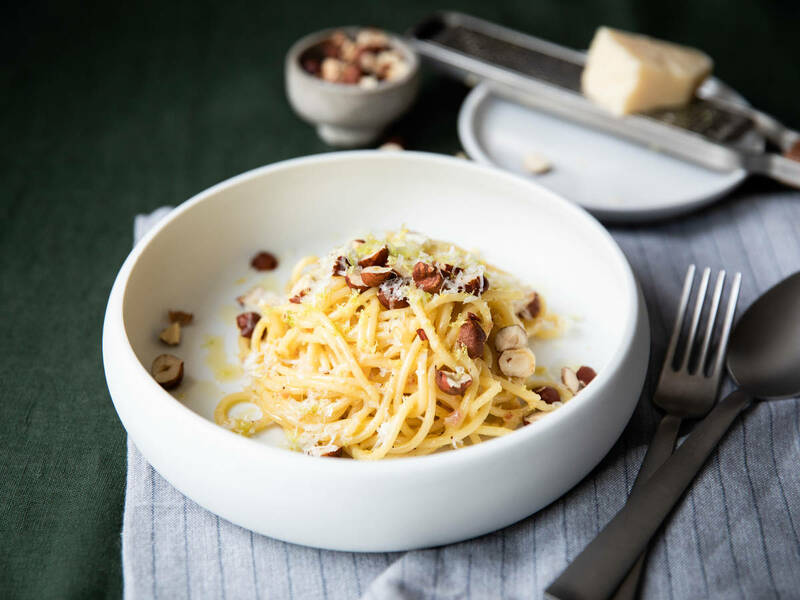 Serve with remaining lemon zest, lots of chopped hazelnuts, and more Parmesan cheese. Season to taste and enjoy!